The current Assembly and Lok Sabha have members from both camps that are involved in the power struggle within the Chautala family. READ | Chautala vs Chautala: who are the players, who is on which side? While the INLD has been inconsistent in the number of seats won, its vote share in Haryana has been between 20% and 30% in most Lok Sabha and Assembly elections during this period. It had reached its peak performance in 1999-2000. In the 1999 Lok Sabha elections, the INLD won 5 out of Haryana’s 10 seats, with the other 5 won by its alliance partner BJP. It polled 29% of the votes in the state, and almost 60% in the 5 seats it contested. In the 2000 Assembly elections, the INLD contested 62 of the state’s 90 seats, and won 47. It polled almost 30% of the votes polled in Haryana, which translated to as vote share over 43% in the 62 seats it actually contested. Since then, the INLD’s performance in Assembly elections has fluctuated, marked by a low of 9 seats in 2005 and a revival to 31 seats in 2009. In the last Assembly elections, it won 19 seats. 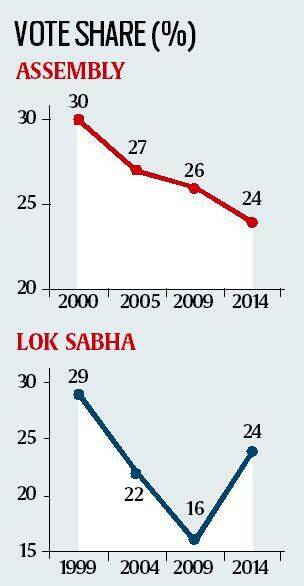 In Lok Sabha elections, the INLD went without seats in 2004 and 2009, before coming back with two seats in 2014. The current Assembly and Lok Sabha have members from both camps that are involved in the power struggle within the Chautala family. The two INLD MPs include Dushyant Chautala, Devi Lal’s great-grandson, whose father Ajay Chautala and grandfather Om Prakash Chautala have been convicted of corruption. Among the MLAs who won in 2014 are Dushyant’s mother Naina Singh Chautala, and his uncle Abhay Chautala. The power struggle is primarily between the families of brothers Ajay and Abhay. An international team of scientists has completed a 3D virtual reconstruction of the ribcage of a Neanderthal skeleton, potentially shedding new light on how this ancient human moved and breathed. The 3D model is different from the longstanding image of the barrel-chested, hunched-over “caveman”. The conclusions point to what may have been an upright individual with greater lung capacity and a straighter spine than today’s modern human. The team, which included researchers from universities in Spain, Israel, and the United States, used CT scans of fossils from an approximately 60,000-year-old male skeleton known as Kebara 2. They focused on the thorax.